I haven't road-tested it yet, because of the holiday, but we will see tomorrow how it works. I'm not sure about it, in terms of functionality. It definitely is pretty, though. I've got a million mindless socks on the needles, which is good in that I don't waste much sitting-around-waiting time, but not much for blog fodder. The more complicated socks on the needles are temporarily abandoned. 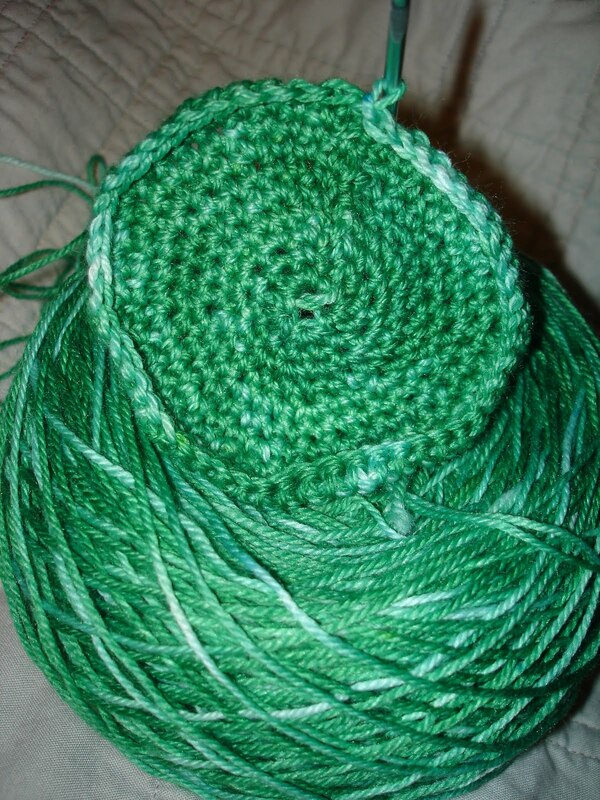 This stole, Lump de Lump (actually One Skein - A Stole! ), occupies that hazardous land between being interesting and being mindless. Which is to say, it's kind of boring. In my effort to feel productive this weekend, it's gotten a lot of play and is probably over halfway done. 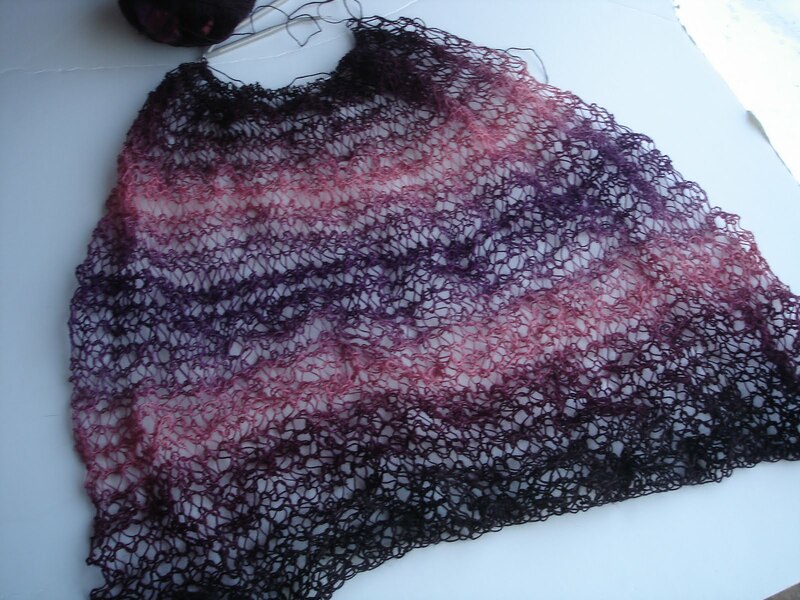 I think it will be lovely once it's finished and I can wear it (which of course won't be for about five months), but for now it's the project that I work on because I need something to work on. One small problem with it is that I suspect that it will block to a much different size than it is now, but in which direction and how much, precisely, is difficult to guess. So I'm not sure when, exactly, to stop. I went through my favorited patterns on Ravelry in order to move some stuff over to my queue, and ended up with a rash of pretty shawls on page six. Perhaps one of those will move me to pick up the needles and cast on something new. Until then, wishing you better mojo than lives at my house right now. I'm considering taking up spinning, but haven't committed yet. So the next best thing, within easier reach at the moment, is crochet. I've finished one successful baby blanket and have a gigantic crochet blanket going that's not going to be finished anytime soon. 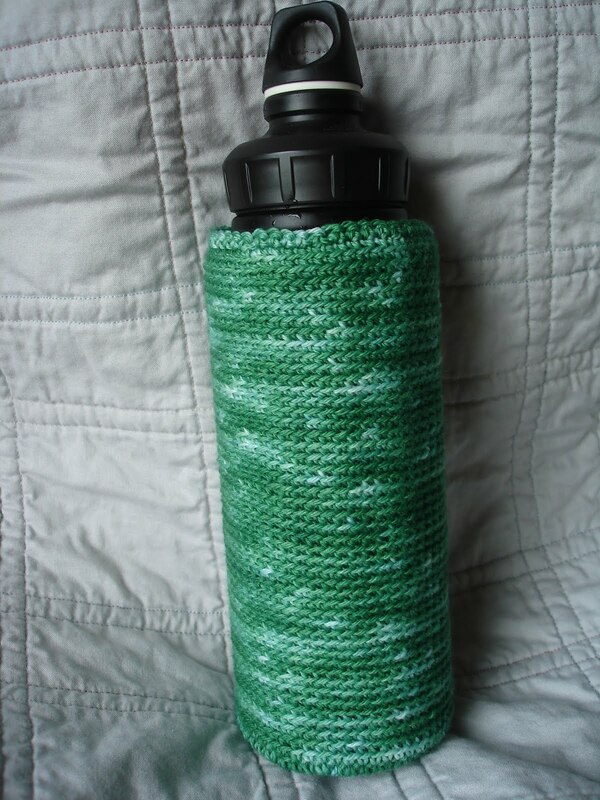 I've wanted to try out amigurumi for a long time, but have never crocheted in the round, so I'm starting with a water bottle cozy. Yes. 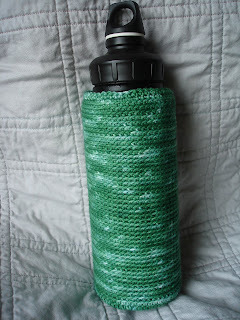 I am making a water bottle cozy. 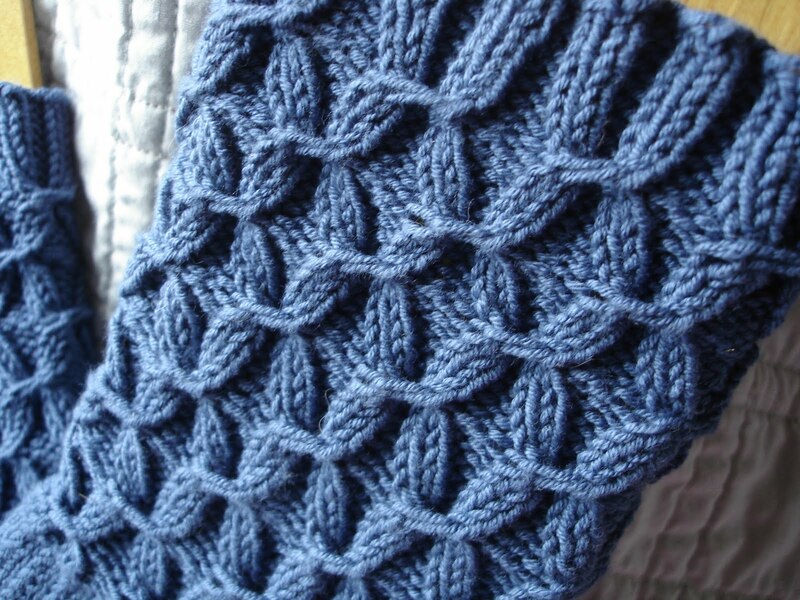 It's called Terrarium, and it's a free download on Ravelry. Here's a terrible, flashy picture of the bottom. The yarn is Pagewood Farms Denali in the Leaf colorway, which is the most perfect green on the planet. I got this in a total impulse buy when I had a rare chance to go back to my old yarn store. I seriously debated whether a humble little water bottle cozy would be worth using this beautiful yarn on, and decided that it would be a better choice than socks, because I'll get to see it every day. (I'm very attached to my water bottle.) I hope it wears well. 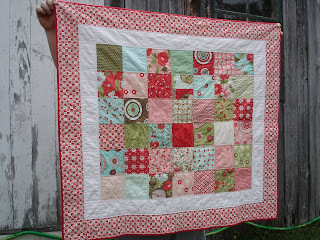 I also hope my quilting mojo returns someday. This was taken pre-wash; post-wash, we have a slight crinkle and even slightly softer flannel. 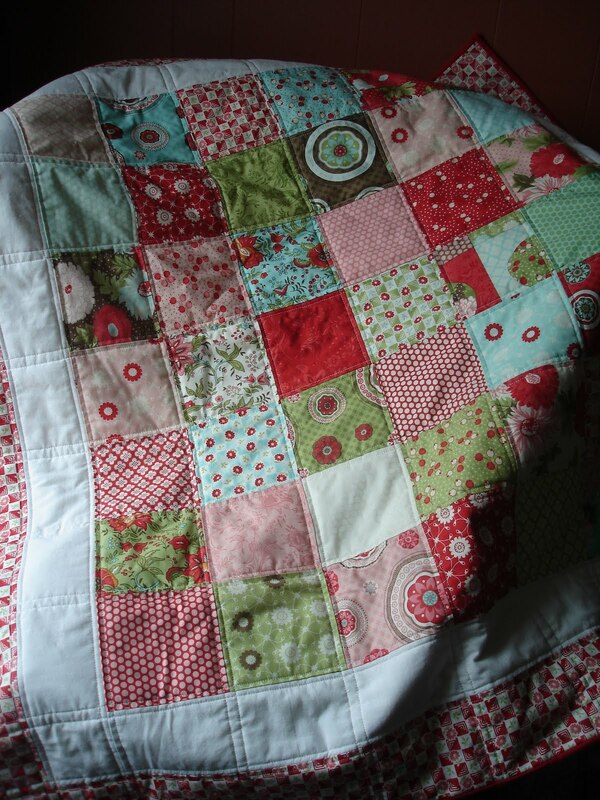 I'll take a better picture for the finished quilts page and maybe do some fancy stuff like measure it. Maybe. This was the first quilt that I didn't pre-wash some of the fabric (others I did, because it wasn't bought specifically for this quilt) and it did not bite me on the hindquarters. Whew. I figured out a better system for quilting straight lines over open territory than squinting and sticking my tongue out a bit, but eventually, for stuff I want to sell, I'll need to cave and buy some tape for line marking. Sometimes it strikes me as funny that we quilters work so damn hard to press and fret over everything being completely flat and perfect, then quilt the thing, toss it in the washing machine, and then it's wrinkly for all eternity. 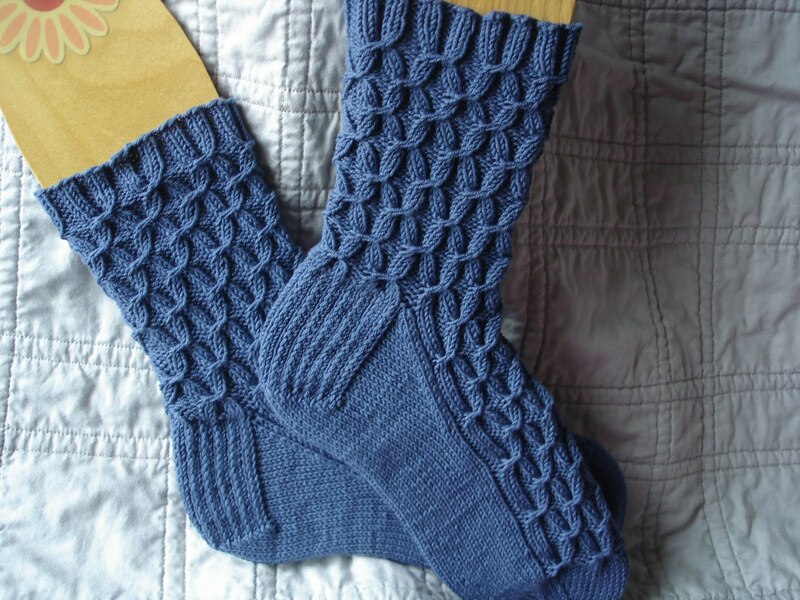 I haven't finished a pair of socks in a while (although I have eight socks otn at the moment), so I'm really glad to get these done. They should jump in the mail on Monday. 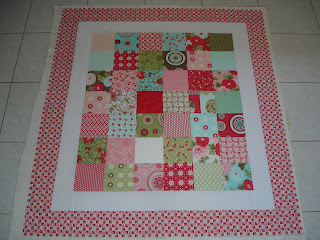 I've been designing a new quilt in my head, although it's not quite worked out yet. The Bliss quilt from the last post is quilted and ready to be bound, and I was hoping to wait to buy fabric for it but caved today and got some solid Kona red from JoAnn's. Maybe once that's bound and finished, I'll be able to throw myself into the new project. Best decision ever. Well, best quilting-related decision ever. Basting is sucky, and thread basting is so sucky that it overwhelms the desire to finish the quilt and leaves me procrastinating and grumpy. I switched to safety pin basting, and it's working just fine. 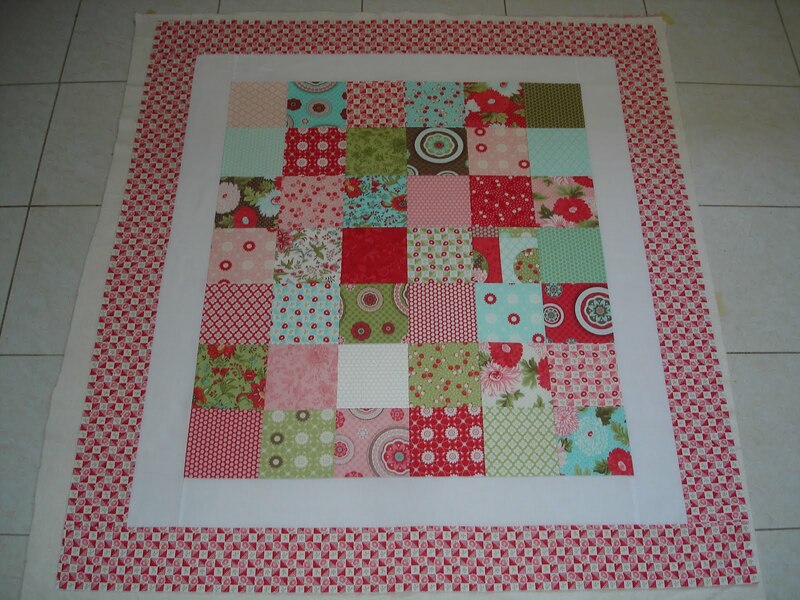 I realized how happy this decision has made me when I sat down to baste the next quilt, which is made from a Moda Bliss charm square stack, some white fabric, and a wee bit o'yardage from a print in that line. This quilt has been just as fast as the squares one before it. I think after the battle of attrition that OMG Pink Quilt was, I've needed to feel like I was making fast progress, and simple charm square quilts are fitting that bill nicely. This entire thing was pieced yesterday, and half of the quilting is done - I loved the grid quilting so much on the first charm square quilt that I'm doing it again. The back is a flannel, also from this line, which I think will prove quite snuggly. Due to my astonishing ability to fail to plan ahead, I have nothing to bind this with. Nothing suitable, anyway. I've got some purple, some jade, and some dark gray. Meh.